Access to affordable and nutritious food is a basic need not being met for many older adults. They’re often faced with having to choose between heating their homes, buying medication, or buying food. Financial insecurity, isolation, lack of transportation, and limited access to information on available services all contribute to the likelihood of older adults being food insecure. In New Hampshire, an estimated 75% of eligible seniors are not participating in the Supplemental Nutrition Assistance Program (SNAP), 70% are not participating in Maine, and 65% are not participating in Vermont. In this webinar we heard about a large farm cooperative that grows and donates fresh fruits and vegetables, a multi-generational lunch program, and a unique collaboration between a food pantry and independent living facility. Representatives from these three innovative programs talked about how they’re able to provide nutritious food and meals for older adults within our communities. Additionally, we’ll learn about traditionally available food programs that help older adults live without hunger, like Meals on Wheels and SNAP. Dale Flewelling talked about Friends of Aroostook in Maine, a local farm cooperative working hard to feed hungry Mainers by planting, harvesting, and donating fresh fruits and vegetables. Dale is a lifelong Aroostook County resident who started this farm after selling his successful transmission business to his son in 2008. Since that time they’ve provided over 200,000 pounds of fresh produce to older adults, low-income residents, and others in need. They are connecting local resources with local needs, and will be sharing more information on what they do and how they do it. Drake Turner joined us from Hunger Free Vermont. As Adult Nutrition Initiatives Manager, Drake works extensively to enhance and integrate policies, procedures, and overall systems for the programs that feed Vermont’s individuals, families and seniors, with targeted strategies to ensure access for vulnerable populations such as seniors, New Americans, and working families with young children. Drake works closely with federal and state partners, local advocates, and community groups across Vermont to improve access to and participation in key programs, most especially 3SquaresVT, the largest nutrition program in the state. They have numerous programs helping older adults, but one in particular takes a unique multi-generational approach. Drake will be sharing information on how they’ve successfully set up summer meal sites at senior centers, and the impact that it is having on those involved. 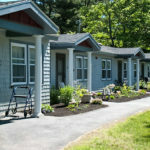 We learned how residents of Bartlett Circle – a neighborhood of apartments, owned by Yarmouth Senior Housing, Inc. (a private, non-profit corporation providing rental housing for seniors, based on income in Yarmouth, Maine) – cook monthly meals with food donated from a local food pantry. This no-cost collaboration enables residents to enjoy a hot meal together while also giving back to their community, as the meals they cook are brought back to the pantry and shared with those in need. Lynde Randall, a resident at Bartlett Circle, will be joining us to share her perspective and information on how the effort is sustained.